​Welcome to Golden Valley Glamping! - Tucked away in the depths of rural Herefordshire at the foot of the Black Mountains you will find our stunning and secluded glamping site. Surrounded by spectacular scenery, green fields and rolling hills we have the perfect location for some tranquility and countryside bliss. Just a short drive away from the famous town of Hay-on-Wye and within close proximity of other equally stunning towns and villages glamping really doesn't get any better than this! Whether you're looking for a quiet retreat for yourself and your partner, a trip away with the family or a place to catch up with close friends and family we are here to cater for all your needs. Our bell tents are spread over two small glamping fields with three bell tents in each field, all are just a short walk from the car parking area, hot showers and toilets. We provide a utility shed with a shared fridge to keep your food cool, electric kettle and electricity points for people wishing to use hair dryers, straighteners or charge mobile phones. We believe we are one of the best glamping sites in the UK and are sure you will have a fantastic time staying with us. 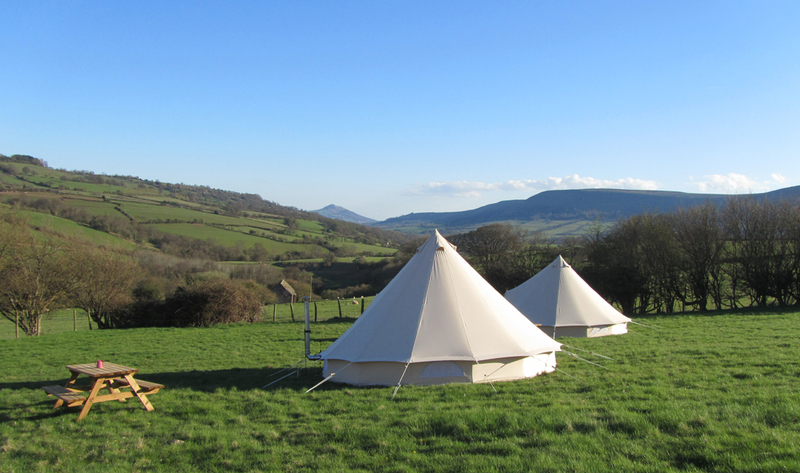 With the Black Mountains and Valley Views as the backdrop to your glamping holiday we are confident that few other glamping sites come close to offering such a special and distinct location.